Thanks to Adam (second from right) for inviting me to stay at his place, taking me out for a night on the town, and being an extremely generous host. And thanks to everyone else, pictured or not, who came out to celebrate with us. It was great to meet you all! Thanks from us tag alongs too….How nice to get a night out to celebrate another state passed and a new one to conquier.. They look like fun bunch. Party on, eh? ND does have cities. 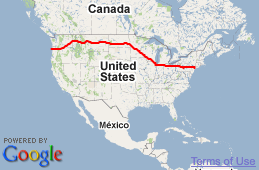 Fargo is a city of about 100,000 people. The metro area has 200,000 people. There are also farming communities but they also do look normal. On second look….is the guy in the back pointing towards god…sayin “hello” or …umm..you know … the iq thing? Katzien…your right…looks like a pary on, Eh? all the way. They do look like fun people :) Glad you were able to have a night out on the town. No offense, Adam, but it looks like you might have outkicked your coverage. Did you see any wood chippers? Toy slayer has one set up … just waiting for the Matt Gtreen Bobble Foot doll to come out…chips away!!! Did you guys go to the Fargo Theater that night? That place is beautiful. I haven’t been there in quite a few years. What is happening with those guys in the back?! I was wondering the same, especially the dude in teh white shirt? Uhhh…. It’s Maliki and he has our women! Could be Maliki all grown up and left the corn fields for the sugar beets. We managed to keep Matt away from all woodchippers…don’t worry! 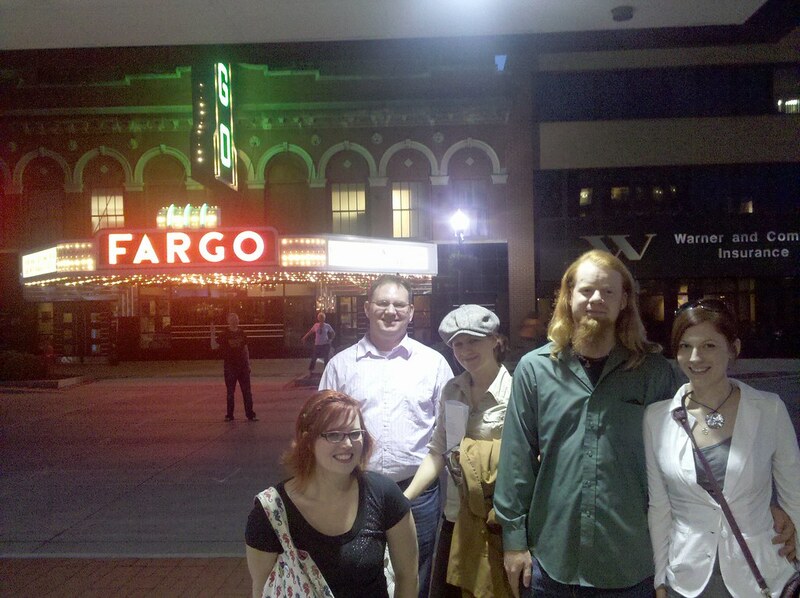 And he got away with the classic Fargo Theatre souvenir photo. WIN! Thanks for visiting with us & safe travels Matt! hehe even people not really IN THE PICTURE even seem to be friendly! I think the guy in the white shirt is being abducted! Those two people in the back are posing for the shot too. I love that you got a night out on the town! What awesome friends. That was cool of them to take you in and take you out. I bet you had a great time!! Adam has AWESOME RED Hair!